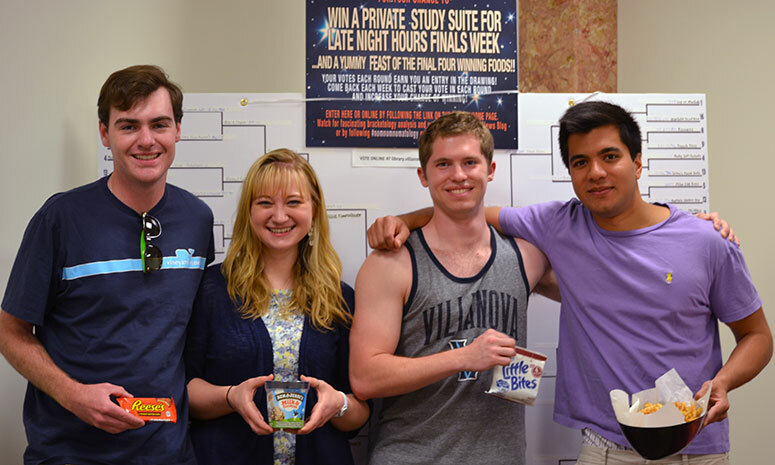 Falvey Memorial Library :: Nomnomnomatology winners! As you may have read, finance-and-accounting major and sophomore Mihir Shah is the lucky winner of the library’s Nomnomnomatology contest for a private study suite for late night hours finals week and a sumptuous feast of Villanova’s final four favorite foods to nosh on while studying! And – who’s the best friend ever? He’s sharing it with a bunch of his study buddies also from the Class of 2017, including (photo above, L-R), Brendan Shea (finance and accounting), Samantha Faust (communication) and Patrick Wallace (psychology.) Mihir is on the far right. Mihir and his friends enjoyed Little Bites brownies, hot fries from Campus Corner, Ben & Jerry’s ice cream, and Reese’s Peanut Butter Cups, and now have private access to a suite in the Library this week, just in time for finals.